Washington (CNN) - Less than half of those surveyed who watched President Barack Obama's State of the Union address reacted very positively to it, a new poll showed. And a while the President emphasized in his speech on Tuesday night that he's willing to bypass Congress and take executive action to accomplish his goals, a CNN/ORC International survey also indicated that only three in 10 said Obama should make unilateral changes to deal with major issues. Forty-four percent of speech watchers questioned had a very positive reaction, with 32% saying they had a somewhat positive response and 22% with a negative response. The 44% who said they had a very positive reaction is down from the 53% who said the same thing following the President's 2013 State of the Union address. And it's slightly lower than the 48% who said they had a very positive reaction to then President George W. Bush's State of the Union address in 2006, as he began his sixth year in the White House. During his address, the President told lawmakers that "I'm eager to work with all of you. But America does not stand still, and neither will I. So wherever and whenever I can take steps without legislation to expand opportunity for more American families, that's what I'm going to do." But two-thirds of those questioned in the poll said that Obama should seek bipartisan compromise when dealing with major issues, with just 30% advocating the President make unilateral changes. Obama spent much of his speech outlining ideas to boost the economy, and unveiled a proposal for a new type of account that allows Americans to save for retirement. According to the poll, 59% said Obama's plans would improve the economy, down 6 percentage points from last year's address. Nearly seven in 10 said that the President's proposals would move the country in the right direction. "But speech-watchers aren't certain that he will actually achieve most of those proposals. Fifty-three percent said that it is very likely or somewhat likely that most of the programs that Obama outlined on Tuesday night will be passed into law, with 46% thinking that is unlikely," said CNN Polling Director Keating Holland. "By contrast, in Bush's 2006 State of the Union address, two-thirds believed that the President would win passage of most of the programs outlined in his speech." Nearly seven in 10 said it is likely that Obama's proposals would be effective at helping lower-income Americans join the middle class, but only 18% said his proposals would be "very effective" in reaching that goal. "Tuesday night's State of the Union audience is more Democratic than the nation as a whole, which is typical for a President Obama speech and indicates that the speech watchers were predisposed to like what Obama said," added Holland. "When George W. Bush was President, his audiences were more Republican than the general public at that time, and his speeches were usually well-received for that same reason." 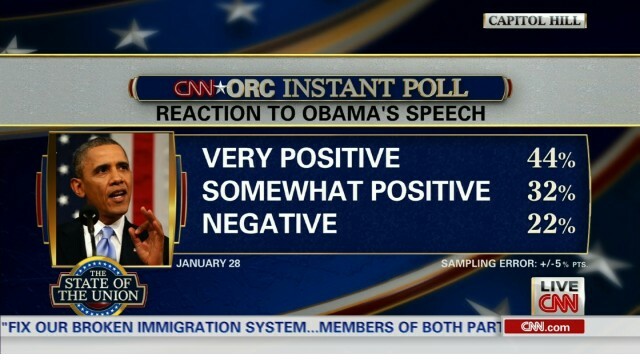 The CNN Poll was conducted by ORC International after Obama's address, with 371 adult Americans who watched the speech. The survey's sampling error is plus or minus 5 percentage points. The sampling of speech watchers were 41% Democratic and 22% Republican. Those numbers indicate that the sample is about 10-12 points more Democratic than the population as a whole. All those Democrats are right there in Congress; now you know why the American people don't approve of their Congressmen. Two thirds of the government is being run by Democrats; you have to learn; this is what you get when Democrats are in charge. All the Democrats look gloomy and full of hate. Those numbers should have been even lower.